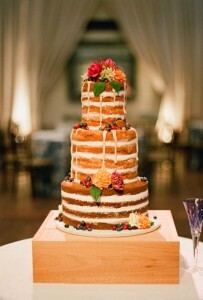 I love looking for rustic, fall-inspired wedding cakes! And today’s naked wedding cake is the ideal modern cake for a late-fall wedding. The three-tiered cake fits the “naked wedding cake” mold as it is sans icing on the outside. But look at all that icing in between the layers! I also love the look of the glaze down the sides of the cake. The cake is decorated with bright colored berries, which along with the orange and pink dahlias add the perfect pop of color to the cake! No need for a cake topper as the flowers and greens do the trick. You can find this rustic, naked cake here. It was created by Favorite Cakes.